Walk to the Evergreen Aviation Museum, home of the 'Spruce Goose', tour dozens of local wineries, the Spirit Mountain Casino, or relax on our manicured grounds. Explore McMinnville's charm, antique shopping, and great food. Very disorganized, we made reservations for 3 and someone took our reserved space and facility would not make them move. We had To take another space and one of the party had to move after 2 days which is not right and there are plenty of open spaces. Will never come here with a group ever again. This was our sixth visit. Each time we typically stay for 3-5 nights. There are many things to do in the area. Beautiful RV park. Very well maintained landscaping and the restroom/laundry facilities are immaculate. Pool area is very nice. Office staff are very friendly and helpful. RV sites are spacious and alway clean. A nice walk over to the Evergreen Aviation Museum and Water Park. A short drive to downtown McMinnville. Many good eateries there and some fun shopping. Many great wineries and fruit growers nearby. We expect to return many more times. A shout out to the management and staff at Olde Stone Village RV Park! From the phone call to secure a reservation to our departure date, Olde Stone Village management and staff were the epitome of customer-oriented service. They were professional, pleasant, friendly, responsive, and helpful. We tried to extend our stay, but unfortunately for us, they were booked. However, as we were heading home, they even went to the extent of calling us to let us know they had received a late cancellation if we were in the area. THANK YOU for the consideration! The grounds were exceptionally clean, as were the restrooms. The RV sites are unusually large and offer a nice space between vehicles and RVs. While we don't have young ones at home any more, the park is family-friendly with swimming, basketball, tennis options. The only draw-back was lack of shade around the sites. We unfortunately hit Oregon during an unusually hot weather streak, and a little shade would have been welcomed. All in all, I would highly recommend this park. The worst thing I could say about it is that with the quality park and customer service they provide, they need to double their size! :) Thank you for making our stay most pleasant. We'll be back! This the real deal. Great facility. Beautiful grounds and services. 10/10/10 rating well deserved! Great campground with a wonderful overall ambience - paved pads with easy hookups and beautiful landscaping - overall a 10 experience! This is how you do an RV campground. It is part of a development attached to the Evergreen Air and Space Museum. Sites are all paved, landscaped, have picnic tables and have hookups on both sides. This was probably the best RV park we have stayed in. Staff are all professional, check in is quick and easy. A shuttle service will transport you to the air museum. I can't say enough good things about this park. This could be the model for how to do a RV resort. We spent several days here and of all the places we stayed this was the cleanest, friendliest, nicest and convenient to local attractions. We would definitely stay here again. This is a great place to stay while in the area and there are lots of opportunities for relaxation or exploring. The park is well run and clean. The pool is generally over run with kids during the day and in general the adults with them don't provide much supervision. The main issue with the rest rooms is that the showers don't get cleaned after use but seem to be before early in the morning. Also, there are two shower toilets for men and women which is way to few for a park of this size. Internet is also slow as usual in most parks since the tendency to stream by members. Our solution is to use our own hot spot. Outstanding Resort! We took our RV club (11 rigs) to this beautiful park, and we can't recommend it highly enough. There was not one single complaint from our members. Immaculate grounds, large sites w/plenty of parking, excellent table/bench, beautiful setting, extremely quiet!! !, pet friendly, easy access to walks, minutes from the wonderful air/space museum (don't miss it), just a few more minutes from historical downtown, etc. The clubhouse is wonderful...perfect, really. Sparkling clean swimming pool, and excellent assistance at front desk. Who could ask for anything more? Thank you to the owners and caretakers! We'll be back ASAP. This was our 2nd time staying here. Everything was great. The large spaces and beautiful landscaping and even thanking us for staying sets your park apart from at least 90% of the others. The staff was very friendly and surprisingly we find sour uncaring people at the front desk of a lot of parks, so we appreciate you for being very friendly also. Stayed one night late April. After hours check-in. Packet was at door. EASY. Park was clean, tidy, & quiet. Good hook-ups. It is located directly next next door to Evergreen Air Museum (Spruce Goose). There is a walking trail from the park or you can take the SHUTTLE. On check-out the office staff was extremely friendly and helpful. Park is Not Pet Friendly as they restrict breeds but allow small yippee dogs. It is an owner and not the dog that is a problem. We are so sorry you feel our park is not pet friendly, we do strive to accommodate guest and their pets. Unfortunately, our park does have pet restrictions that apply to particular breeds and weight (not more than 50 lbs.). We are truly sorry for the inconvenience this might cause pet owners. When we were in Astoria, OR, we had an accident with our tow vehicle. We came to McMinnville because J&W Carstar said they could fix it. We were very fortunate to be able to get a reservation at Olde Stone Village RV Park. One fiasco turned into another and our vehicle was totaled. The folks at Olde Stone Village have gone out of their way to accommodate us. While they were full almost every night they were able to find a spot for us every night, mostly for one night which required us to move every day or two. One night we spent in the storage area which had 20 amp power, enough to keep us in business. The managers and their staff are absolutely phenomenal. We have never met more dedicated people. The campground is certainly under-rated at 10/10/10. It should be 100/100/100!! We have traveled throughout the great United States and parts of Canada and have never experienced a campground like Olde Stone Village. This facility is our number 1 rated campground. We highly recommend Olde Stone Village but one warning: reserve early as this park is so popular it fills up quickly. Thank you for such a lovely, review. We strive to have great customer service. Helping everyone enjoy their visit at Olde Stone Village. We tried to do our best in a making a bad situation good to help this couple who had one fiasco turned into another. Very nice facility and worked with our group of 7 rvs. Right next to Evergreen air and space museum which has shuttle that comes to RV park. Work be nice if they provided a fenced area for dogs to run. They seem to have plenty of space for one. We are happy that you enjoyed your experience. We are always open to suggestions on the best way to improve our park. We will definitely take your suggestion into consideration. 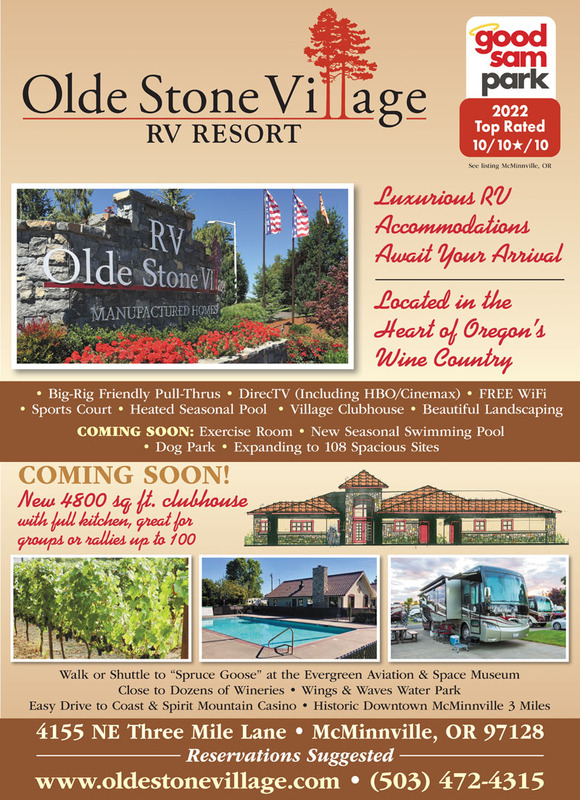 We have stayed at Olde Stone Village before and it is our go to campground when visiting the Oregon Wine Country. The sites are long enough and level for larger motorhomes. Maneuvering through the park is fairly easy. WII FI and cable work fine. The park is well tended and clean. Strangely, they are perfectly okay with cleaning rigs - hoses and all which is a plus. It's a great location to explore wine country and close enough to Portland for easy day trips. The biggest ding is the staff. Their responses are perfunctory as if they are completely bored with their job. We called to make a reservation for two weeks, and the young lady who answered the phone said they could not accommodate us. I asked her if we changed sites would there be a site available. She said yes. Really? Shouldn't that be a routine step when someone calls to make a reservation? And to make matters worse, the second week we moved to the new site (after verifying with the office that we really did have to move) and no one every was assigned to our original site. Maybe there was a mix up, I don't know. But there was never even the remotest of apologies for us moving for no reason. Where is the customer service???? We are sorry to hear about this experiance. We are always striving to provide good customer service. Please know that we are always working at becoming better, so please try us again. 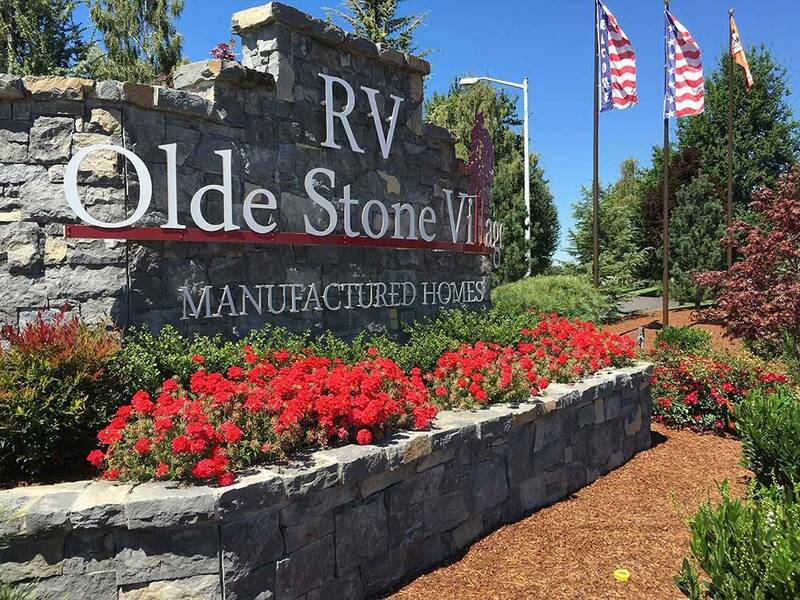 Olde Stone Village RV Park in McMinnville was a great place for our family of 6 to stay. It was a half way point between home and our final destination on the northern Oregon coast. We stayed for two nights and enjoyed the swimming pool and playground both days. The grounds were well kept and the front desk staff was very friendly. We arrived after hours and our reservation information packet was attached to a board outside of the main office. We easily found our spot and got set up in no time. The pool was a good temperature and a great way to cool off and relax before going to bed. The main reason we stayed here was it's proximity to the Evergreen Air and Space Museum and Waterpark. We rode our bikes to the museum our first night there on the adjoining path and were able to see the aircraft that sit around the grounds of the facility. It was a fun sneak peak of what we were going to see inside. We spent the first half of the following day at the museum and took in the IMAX movie. We went back to our camper for lunch and then changed for the waterpark. The waterpark was fun and had a lot of variety with various slides, pools and a splash playground. Admission to the waterpark also includes a hands-on interactive educational water play area upstairs that the kids enjoyed. We could have spent more time in both the museum and waterpark but we were able to fit it all in just one day. It was nice to be so close to both facilities and the entire Evergreen campus. We will definitely visit again and I would recommend this park for anyone looking to see the museum and waterpark or the surrounding wine country. We are so happy you liked our park! Thank you for your great reveiw!